Imagine being the team behind one of the most long-running and well-respected franchises in videogame history. Imagine that as a company you’ve created the fifteenth iteration in the franchise to significant critical and economic success, before you’ve even released it on PC. 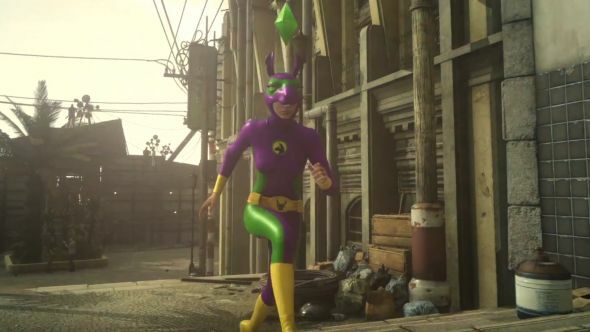 Then imagine adding some bizarre Sims 4 superhero outifts to your game to help sell it on PC. Congratulations, you’ve just imagined Square Enix’s Final Fantasy XV marketing campaign. Here’s what we want from Final Fantasy XV’s modding scene. As if the Half-Life Pack, which was announced last week, wasn’t enough, Square Enix have just announced the Sims 4 pack for Final Fantasy XV Windows Edition. If you buy the game on Origin before May 1, 2018, you’ll get access to the pack, which gives you the Llama Man and PlumBob skins for your in-game characters. These are apparently genuine Sims 4 references, but I had to ask around the office in case they were just random spandex uniforms that Square Enix had slapped onto the game. Crucially, you do get the green diamond above your head to indicate your mood, but sadly I don’t think it actually changes colour. Final Fantasy XV releases for PC next week, on March 6, so you’ve got plenty of time to get hold of the Sims 4 pack if you really want it. Unfortunately, it seems that you won’t be able to get both this and the Half-Life pack, as they require you to purchase the game on two different platforms. But then again, if you’ve got too much money for your own good, you could always buy both versions. You can check out a video trailer for the Sims 4 pack at the top of this article.